The Abu Garcia Revo® Beast raises the bar when it comes to high performance and durability in a low profile design. Engineered for strength from the ground up, the Beast features titanium coated sideplates, 7 stainless steel HPCR bearings + 1 roller bearing as well as an X-Cräftic alloy frame for increased durability and corrosion resistance. A max drag rating of 22lbs along with the dependable Duragear brass main gear and the tried-and-true Carbon Matrix drag deliver impressive power and durability in a surprisingly compact package. 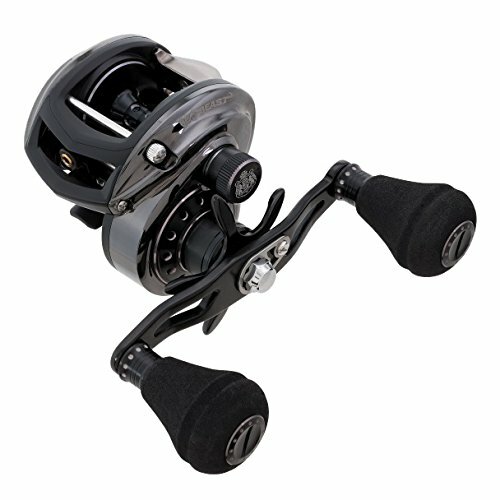 Get the upper hand on hard fighting fish with the extended bent handle and round EVA power knob. The Infini casting brake incorporates the use of both an internal centrifugal brake as well as an externally adjustable magnetic brake to give anglers almost limitless adjustability.